This recipe (found of page 66) from “Around My French Table” by Dorie Greenspan had me and my husband licking the bottom of our soup bowls clean. 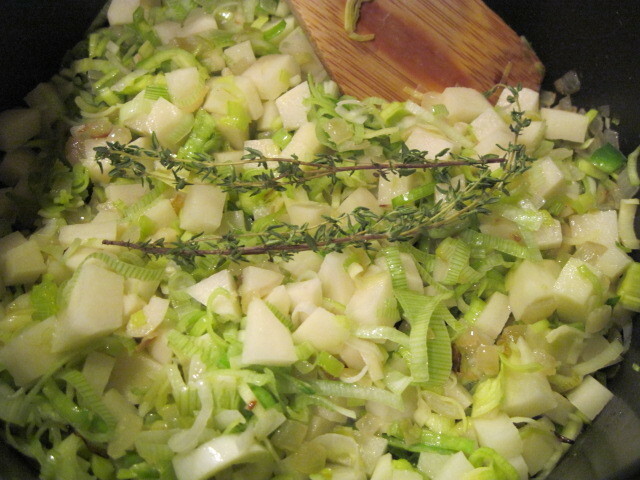 The mellow and yet kicky taste of the leeks combined with the potato and herbs were nothing short of perfection. I did however make a few small additions because one, I had these items on hand and wanted to use them up and two, I just love to experiment. My additions were, a few bay leaves, about 3/4 cup ricotta cheese and some fresh grated nutmeg because I’m simply wild over the taste of nutmeg lately. I found this recipe easy to follow and delightfully simple to prepare. The prep time was relatively short and dinner was put on the table in no time. As we all know, this is a huge bonus during the busy holiday season. Simmered together on the stove top with chicken broth and whole milk, this soup has a delightful aroma and was soon calling our names to come and eat. I could have left the texture in tact instead of using my immersion blender, but my immersion blender is just so much fun to use and for this soup, it’s perfect match for a creamy and light consistency. 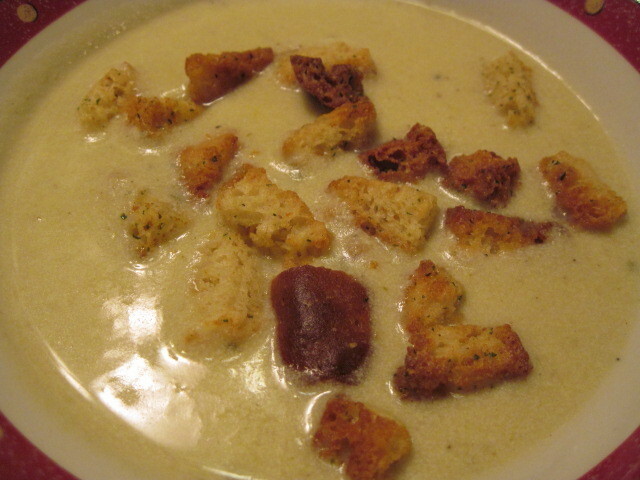 Topped with some store bought croutons for a bit of crunch (I was feeling lazy at this point) and some homemade cloverleaf biscuits (will be posting that recipe soon) and we were in wintry soup heaven. Join me again next Friday when I’ll be doing my posting for Dorie’s spiced glazed carrots. Mmmm. Good!!! Loved, loved, loved this soup. Also added the nutmeg – I agree it was a perfect fit. Like the concept of adding the ricotta – how was that texturally? Your additions sound great. I would have never have thought of the ricotta cheese, but I bet it was even creamier. I made this soup this week and we loved it as well. I thought the broth was wonderful. Your soup looks delicious! I also love nutmeg, I bet it was great in this. Yay for winter comfort foods! Mmm, beautiful job. 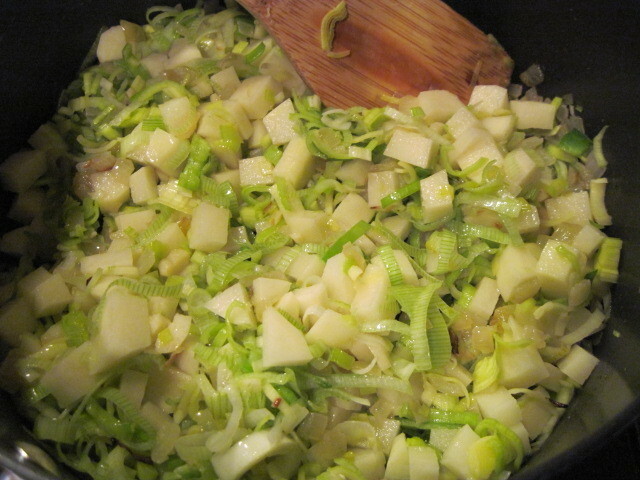 I love leek and potato soup, and your additions sound great! Delish. I love the idea of some ricotta cheese in there! I would have done that if I had thought of it! That soup looks awesome! I love a hot rich soup this time of year. Looks wonderful Renee…some might call it a great first course but I call it a meal. Thinking of doing this for next week; and like another reader; very curious about the ricotta; sounds delish! 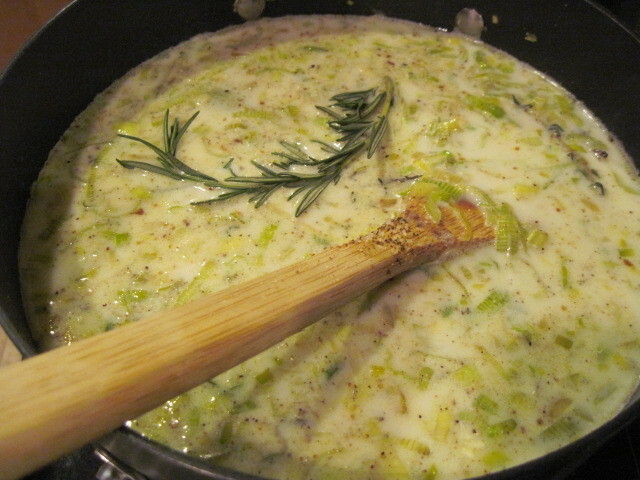 The ricotta cheese rather "melted" into the soup just leaving a creamier texture. Of course the use of the immersion blender aided in the creamy texture too. I would recommend the additions. OMG I love your masthead! It's so fresh and lively! I'd wanted to put nutmeg in my soup too! I'm definitely doing that next time. Looks great! I made this too this week and added BACON…such a perfect complement. Yum, Yum!! Cloverleaf biscuits sounds delicious with the soup! I might wait ill you publish the recipe before trying Dorie's recipe!. Thank you for visiting my site and commenting. I accidentally deleted your comment (was on my iphone) and the fingers were doing crazy things. Sorry! 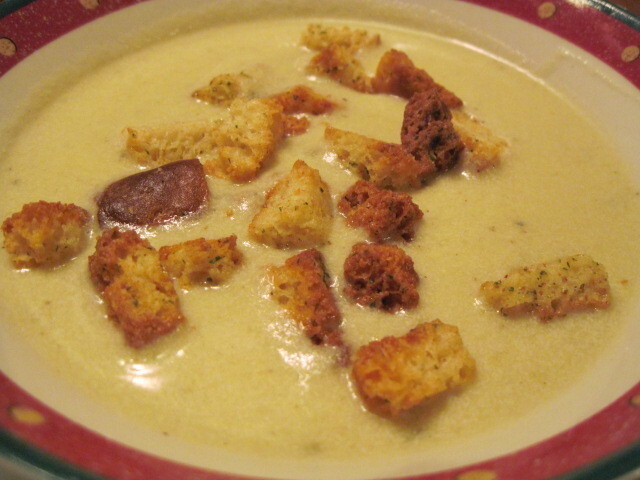 I love potato soup, this version you made looks wonderful. Great post.